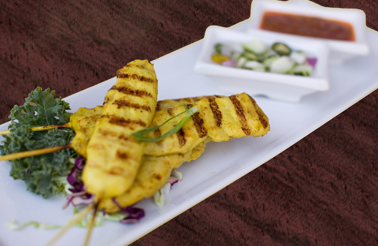 Sliced chicken marinated in coconut milk, curry powder and Thai herbs, barbecued on skewer; served with peanut sauce and cucumber salad. 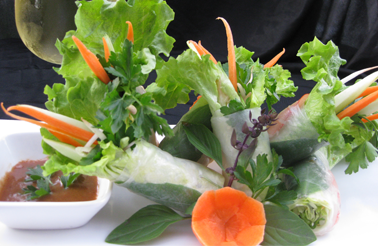 Rice paper wrapper wrapped with romaine lettuce, beansprout, cucumber, cilantro, carrot, mint leaf and Thai basil with choice of chicken, shrimp or tofu served with special house peanut dipping sauce. Crispy deep fried sweet potatoes with sesame seeds and coconut flakes batter; served with house dipping sauce and sprinkled with crushed peanut. 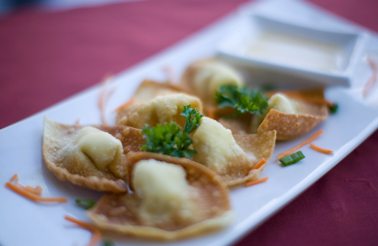 Deep fried tofu; served with house dipping sauce, topped with crushed peanut. 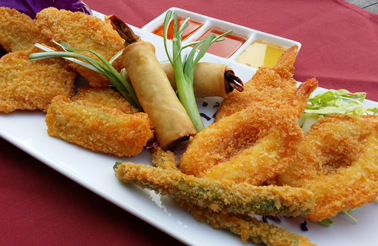 Deep fried battered shrimp and seasonal vegetables; served with special house sauce. Deep fried battered calamari and seasonal vegetables; served with special house sauce. 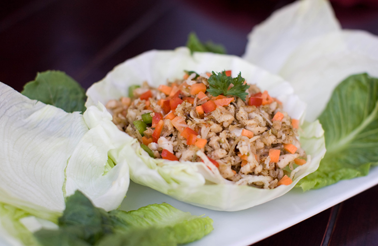 Ground chicken sautéed with diced carrot and red bell pepper, mixed with blended paste of minced roasted coconut, cilantro and lemongrass; served with lettuce. 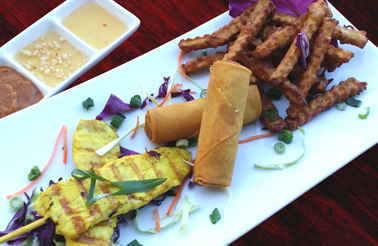 Combination plate with Chicken Satay, Vegetarian Spring Rolls and Sweet Potatoes. 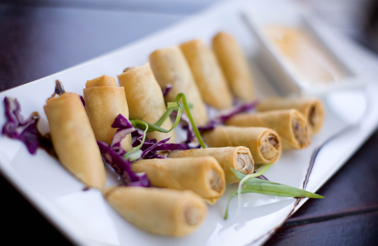 Combination plate with crispy shrimp, crunchy calamari and Vegetarian Egg Rolls. 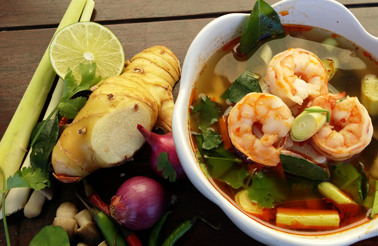 lemongrass, galangal, kaffir leaf and cilantro. Mixed green salad served with ginger dressing. Mixed green salad, tomato, cucumber, carrot and crispy noodle served with peanut dressing, garnished with fried wonton skin. 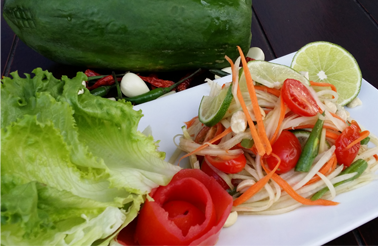 Shredded green papaya with carrot, tomato and green bean, then tossed with chili pepper, crushed garlic and fresh lime juice, topped with roasted peanut; served with lettuce. flavored with lime juice and chili; served with lettuce. 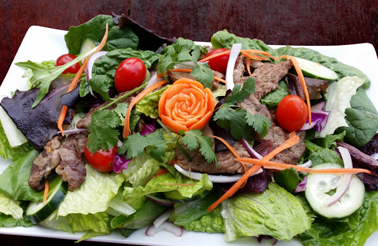 Grilled beef mixed with ground roasted rice, red onion, shredded carrot, cilantro, cucumber, tomato; flavored with lime juice and chili on mixed green salad. Grilled chicken and shrimp with cilantro, red onion, shredded carrot and lemongrass; flavored with lime juice and chili on mixed green salad. 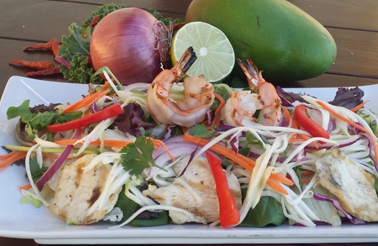 Grilled chicken and shrimp with cilantro, red onion, shredded carrot and green mango; flavored with lime juice and chili on mixed green salad. 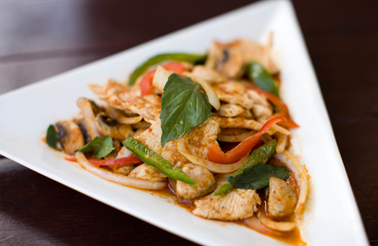 Sautéed chicken with garlic, chili paste, mushroom, onion, bell pepper and Thai sweet basil. 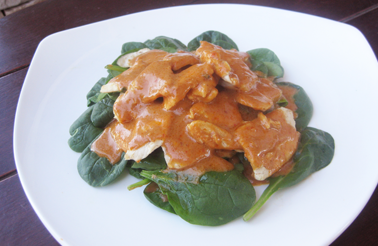 Sautéed chicken on a bed of spinach; topped with house peanut sauce. 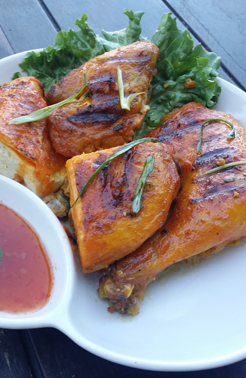 Grilled tender, marinated half chicken with Thai herbs; served with house secret sauce. 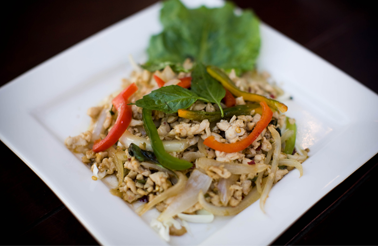 Ground chicken sautéed with fresh garlic, chili, onion, bell pepper and Thai sweet basil. 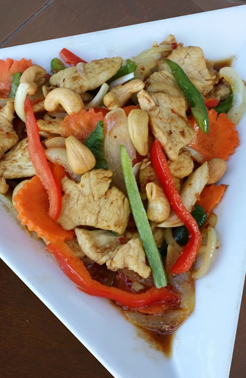 Sautéed chicken with garlic, onion, bell pepper, carrot and roasted cashew nut. 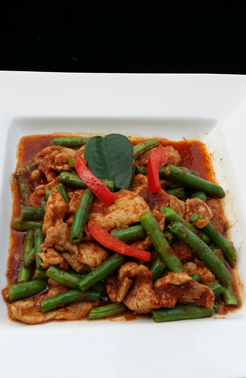 Sautéed chicken with Prik-King chili paste, green bean; topped with shredded kaffir leaf. 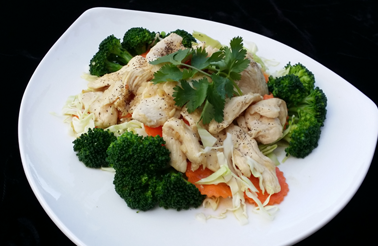 Sautéed chicken with fresh garlic and pepper on a bed of shredded cabbage, served with steamed broccoli and carrot; topped with cilantro. 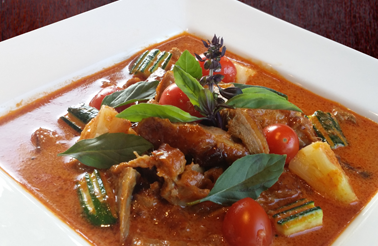 Sliced boneless roasted duck prepared in red curry coconut milk, pineapple chunk, cherry tomato, bell pepper, zucchini and Thai sweet basil. 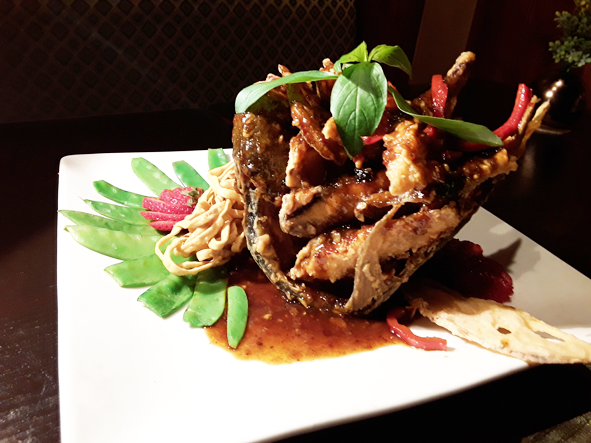 Boneless roasted duck sautéed with special sauce, chili, garlic, onion, bell pepper, pineapple chunk, carrot and Thai sweet basil. 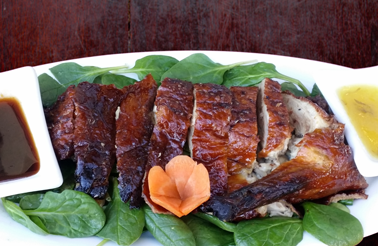 Crispy boneless roasted duck on sautéed spinach; served with house pineapple sauce and special duck sauce. Sautéed pork on a bed of spinach; topped with house peanut sauce. Sautéed pork with garlic, chili, onion, bell pepper and Thai sweet basil. Sautéed pork with fresh garlic and pepper, on a bed of shredded cabbage, with steamed broccoli and carrot; topped with cilantro. Sautéed pork with Prik-King chili paste, green bean; topped with shredded kaffir leaf. Sautéed beef with garlic, chili paste, mushroom, onion, bell pepper and Thai sweet basil. Sautéed beef with garlic, onion, bell pepper, pineapple chunk, carrot and special sauce. Sautéed beef with garlic, chili, onion, bell pepper and Thai sweet basil. Sautéed beef on a bed of spinach; topped with peanut sauce. 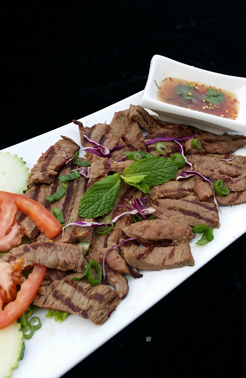 Thai style marinated top sirloin beef (about 12 oz..), grilled and thin sliced, served with spicy “Tiger” sauce, garnished with tomato and cucumber. 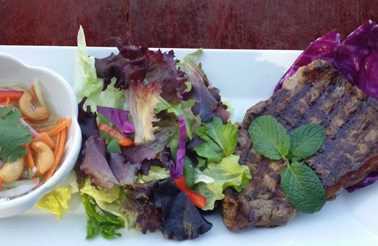 Grilled tender rib-eye steak served with mixed spring salad and shredded green mango in exquisite sauce. 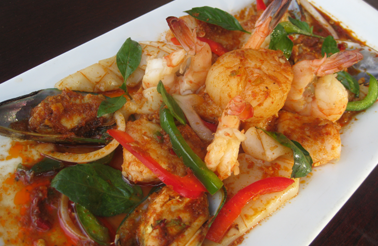 Mixed Seafood (Shrimp, sole fillet, calamari and green mussel) sautéed with garlic and pad-cha chili paste, onion, bell pepper and Thai sweet basil. 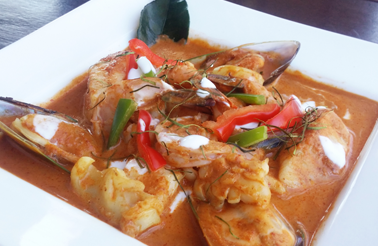 Mixed Seafood (Shrimp, sole fillet, calamari and green mussel) prepared in red panang curry coconut milk; garnished with bell pepper and shredded kaffir leaf. Sautéed shrimp on a bed of spinach; topped with house peanut sauce. Sautéed with garlic and pepper on a bed of shredded cabbage with steamed broccoli and carrot on the side; garnished with cilantro. 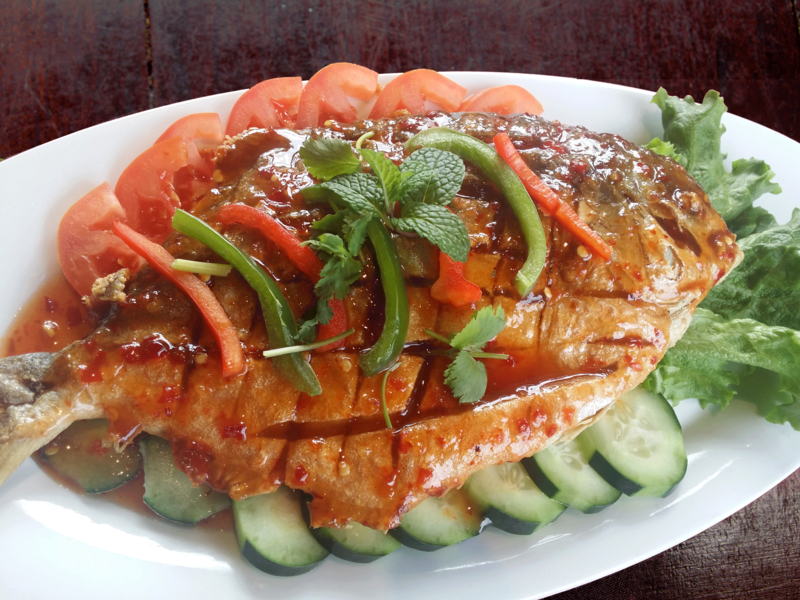 Deep fried fish fillet on a bed of shredded cabbage, cucumber and tomato; topped with spicy three flavor sauce and garnished with bell pepper and cilantro. 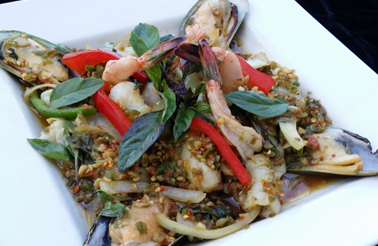 Mixed Seafood (Shrimp, sole fillet, calamari and green mussel) sautéed with fresh garlic and chili, onion, bell pepper and Thai sweet basil. 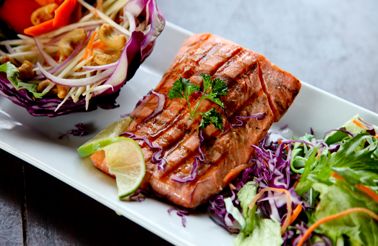 Grilled fresh salmon served with mixed spring salad and shredded green mango in exquisite sauce. 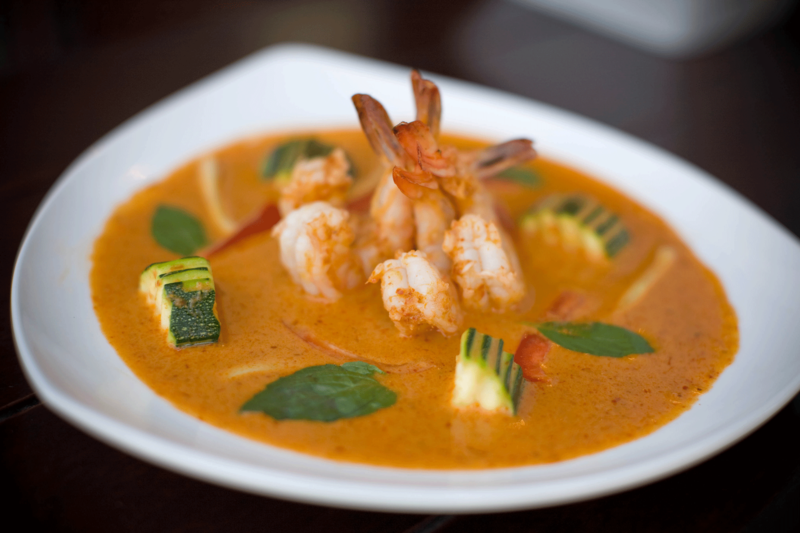 Prepared in red curry coconut milk; with bamboo shoot, zucchini, bell pepper and Thai sweet basil. 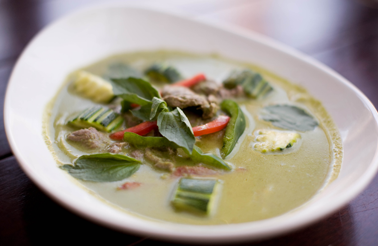 Prepared in green curry coconut milk; with bamboo shoot, zucchini, bell pepper and Thai sweet basil. 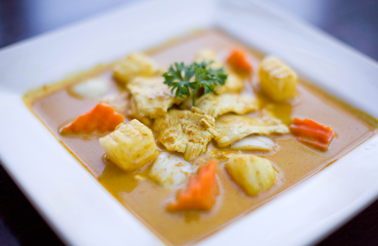 Sliced chicken prepared in yellow karee curry coconut milk, with onion, potato and carrot. 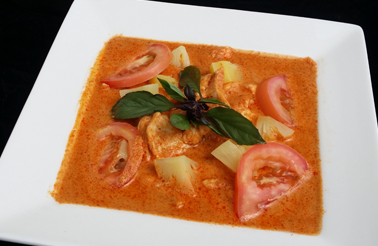 Sliced chicken prepared in red curry coconut milk, with pineapple chunk, topped with sliced tomato and Thai sweet basil. 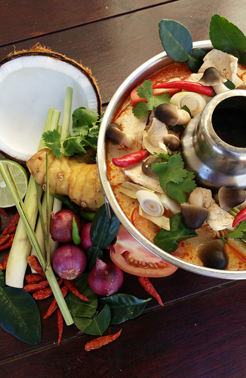 Prepared in red panang curry coconut milk; topped with sliced red and green bell pepper and shredded kaffir leaf. 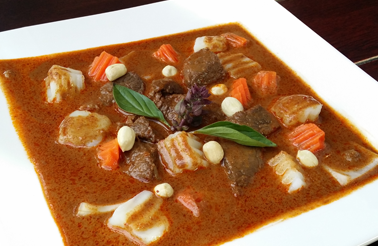 Cubed beef stew prepared in mus-sa-mun curry coconut milk, with onion, potato and carrot; topped with roasted peanut. 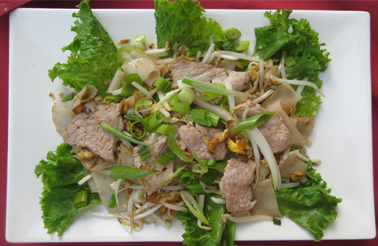 Pan fried thin rice noodle with choice of chicken or pork, egg, shallot, green onion, bean sprout and carrot; flavored with sweet and sour tamarind sauce. 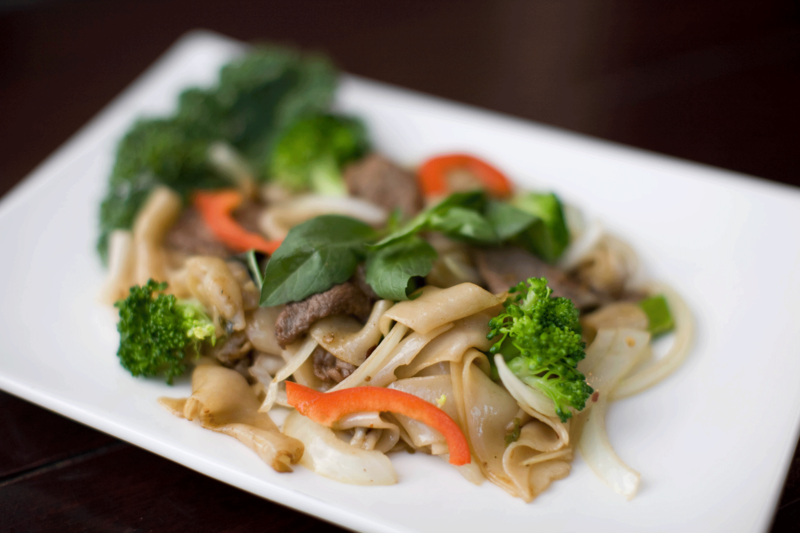 Pan fried flat rice noodle with choice of chicken or pork, garlic, chili, onion, bell pepper, broccoli and Thai sweet basil. 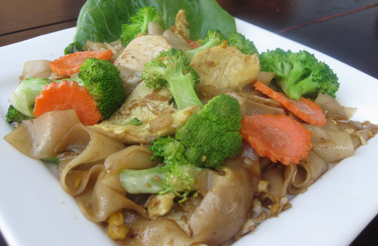 Pan fried flat rice noodle with egg, garlic, pepper, broccoli and carrot; flavored with soy glaze. 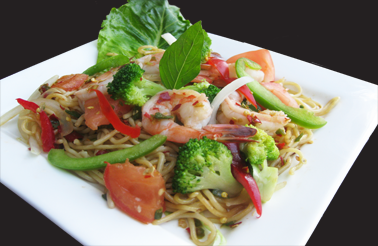 Stir fried spaghetti with choice of chicken or pork, garlic, chili, onion, bell pepper, tomato, broccoli and Thai sweet basil. Choice of chicken or pork, prepared in Panang curry on a bed of spaghetti; topped with bell pepper and shredded kaffir leaf. 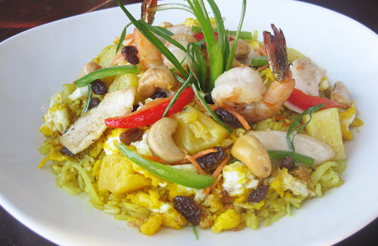 Pan fried rice with chicken and shrimp, egg, curry powder, garlic, onion, bell pepper, carrot, pineapple chunk, raisin; garnished with green onion. Pan fried rice with choice of chicken or pork, egg, garlic, onion, pea and carrot; garnished with chopped green onion; served with tomato and cucumber. Pan fried rice with choice of chicken or pork, fresh garlic, chili, onion, bell pepper and Thai sweet basil. 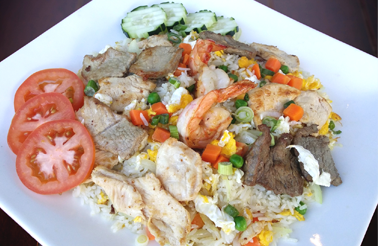 Pan fried rice with chicken, beef, pork, shrimp, egg, garlic, onion, pea and carrot; garnished with chopped green onion; served with tomato and cucumber. 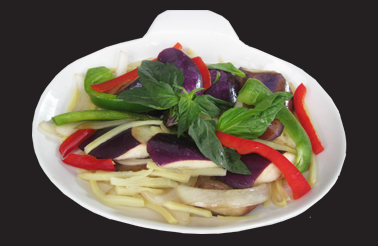 Sautéed eggplant with garlic, chili, onion, bell pepper, bamboo shoot and Thai sweet basil. 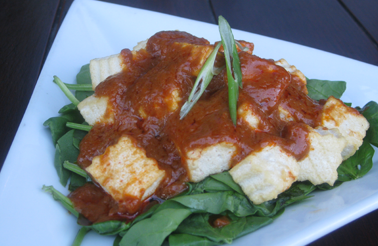 Deep fried tofu on a bed of spinach, topped with peanut sauce. 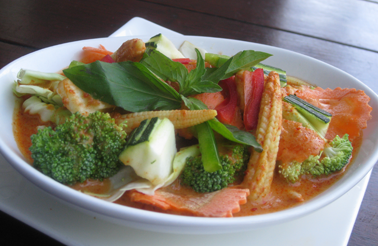 Mixed vegetables prepared in red curry coconut milk with bamboo shoot, zucchini, bell pepper and Thai sweet basil. Tofu prepared in green curry coconut milk; with bamboo shoot, zucchini, bell pepper and Thai sweet basil. Broccoli, cabbage, carrot, baby corn and bean sprout sautéed with oyster sauce. Pan fried thin rice noodle with mixed vegetables, egg, shallot, green onion, bean sprout and carrot; flavored with sweet and sour tamarind sauce. 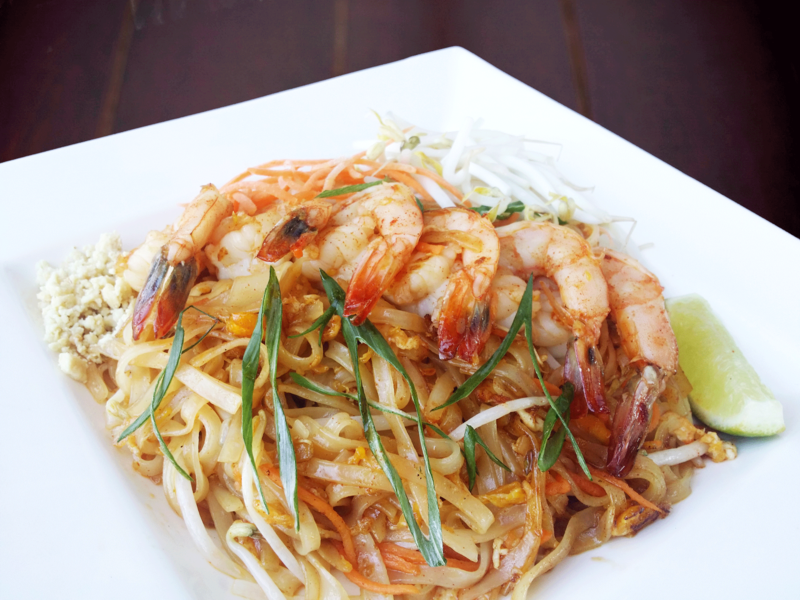 Pan fried flat rice noodle with garlic, chili, onion, bell pepper, mixed vegetables and Thai sweet basil. Pan fried flat rice noodle with egg, garlic, pepper and mixed vegetables; flavored with soy glaze. Pan fried rice with egg, curry powder, garlic, onion, bell pepper, broccoli, cabbage, baby corn, carrot, pinapple chunk and raisin; garnished with green onion.